In today’s world, we all know about the option of using your voice to control lighting, security cameras, and electronics with smart devices. With Wi-Fi and the right smart devices, you can control your lights from anywhere. In fact, you can schedule the lights in your home to illuminate when you want them. When you’re gone – a family vacation – you can set up a random schedule that makes it seem as if you're at home. 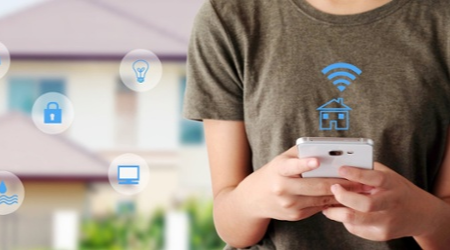 A rapidly increasing number of homeowners are adding connectivity, automation, and smart technology into their homes. These systems go way beyond lighting. For many, the reason for using smart features is to help save money, especially on electric bills. It doesn’t matter whether you live in Capitol Hill, Logan Circle, or Bowie – summers are hot, and winters are cold. That means your heating and cooling system is working harder at least two seasons out of the year. Smart thermostats can help reduce the demand simply by "learning" routines and preferences and adapting to minimize usage. They also allow you to set temps from outside the home – so if you are going to be arriving home hours later than planned, you can keep the heat lower until you're on your way back. Nest, well-known for being one of the top smart thermostats, also has a full range of smart devices to add convenience to your home. The perks of a product like Nest? Nest does the bulk of the work for you: It knows when you're home, learns what you like, and adapts to your preferences. A product like Samsung’s SmartThings connects your smart home automation network and allows you to optimize the functionality and efficiency of the whole home. By tying everything together, you can manage your smart products more efficiently to help reduce electric bills. Further, it adds the convenience of using your voice (at home) and the ability to make changes remotely all from one command center. A great example of a smart home hub in action: You decide to stay somewhere overnight; You log in to your app and lower your thermostat (which was programmed for your arrival), schedule the outdoor lights to go off at 10 p.m., and make sure there is nothing on that shouldn’t be. If you’re ready to transform your home into a smart one, contact Wilcox Electric. Our trained technicians can help you find compatible devices, identify related electrical work that might need to be done, and walk you through how to use your new smart features. With an initial phone conversation, we will assess what you want and the options available. Based on the scope of the work we can coordinate with your other contractors.